After you shop the local Propane providers for the best prices and the best “new customer” deals, make two phone calls. (1) Call the old supplier and tell them to come get their tank. They have no motivation whatsoever to be cooperative and speedy, so they will show up when they want to, probably after you nag them with several follow-up phone calls. (2) Call the lucky new provider and tell them to bring you a new tank and some gas. They will arrive quickly, remove the competitor’s old tank, and, happily, set it somewhere. They will install your new tank. Then a tanker will arrive and fill your tank. Most residential tanks in California have a 250 gallon capacity. They will fill it the first time at about 85% or 200 gallons. The technician(s) will open the valves and hang around for a few minutes while the propane fills the empty pipes in your system. This is called “charging” your system of pipes. Then they will test your system for leaks with a water manometer that they will attach at the regulator. If the manometer holds steady everybody shouts “Hoorah!” You are leak-less. But if the liquid column in the manometer drops, then you have a leak. Somewhere. If you do have a leak, as indicated by falling pressure in the manometer, the technician(s) will get out an old fashioned squirt bottle or an electronic sniffer or both and start tracking it down. Sometimes, after they locate the leak, if it is a simple tighening of a loose fitting, they will fix it for you, but they may stop, turn off the system entirely and tell you to call the plumber or heating-and-air guy or other tradesman. The propane guys will return only after repairs are made. So, lets hope they don’t find any leaks in the first place. Or, if you do have a leak, let’s hope they DO find it! By the way, you should be asking this question: just how, exactly, do they remove the old 250 gallon tank and replace it with a new 250 gallon tank? These tanks weigh hundreds of pounds. If the tank is sitting on a pad conveniently near a street or driveway, or the ground is firm and relatively flat, they drive the truck up next to the pad and lift the old tank off with a hoist, put it aside, then lower the new tank into place with the hoist. But, the pad is almost never next to a driveway or street. The tank is usually up a hill behind the big tree where it can’t even be seen from the street. What then? Yep, uphill. Across the lawn, through the weeds, 3 or 4 guys drag the new tank up to the pad. How do they move the old tank down hill? They slide it. Wheeeeeeee! Now you know a lot more about propane tank switching than you did a minute ago. Our most available energy is the conversion of sunlight into calories through photosynthesis by plants. This transformation of energy approaches true sustainability. It’s not absolute sustainability (remember entropy? ), but it’s very, very close. Here’s a question for you. Can we find a way to capture solar energy through a sustainable technology over the long haul (almost-forever) and without reliance on fossil fuel, that is, without petroleum? One solar panel powers an electric pump that brings drinking water up from a deep well. Take it from one who knows about these things, we are having to drill deeper and deeper wells, and the only way to get the water up from a deep well is with an electric pump. Once the solar-powered pumping system is working, the water is practically free and does not rely on petrochemicals. It leaves no carbon footprint. It is about as safe, environmentally friendly, and sustainable as you can make a system for retrieving deep water. Until the solar panels wear out. A good panel may last twenty or twenty-five years, maybe longer, though they begin to degrade as soon as they’re installed. Doesn’t everything? Every human generation, then, is going to have to replace its solar panels. Where do the panels come from, most of them, right now? How do we get solar panels from a factory in China to our home or farm? On a boat or a plane or a truck or some combination, all powered by petroleum, dragging along a huge carbon contrail. If we are going to have solar panels in a post-petroleum world, we are going to have to learn how to manufacture them locally. Imagine a world in which the “panel maker” is as important to the community as the blacksmith or the doctor? If solar panel fabrication can be localized, other possibilities open up, because electricity can be used for lots of swell things besides powering well pumps. Well pumps wear out even faster than solar panels. With luck and decent water (not too much iron and other minerals), we might get twenty years out of a pump, though most of them are rated for ten to twelve years. For a generation or two we might be able to repair pumps with parts that we salvage from other pumps. Then what? Do we have to manufacture well pumps locally? I am trying to get my head around the idea that a time will come when there will be no trucks on the freeways delivering the stuff we need, like well pumps. No trucks at all. When will that happen? When will the trucks stop rolling for good? When they run out of gas. We can think about trucks blasting down the interstate consuming vast amounts of fossil fuel. But that’s just a tiny part of the story. The truck is also using petrochemicals as engine oil, brake fluid, lubrication and other direct applications. Then think about the fossil fuels used in the manufacture and materials for the tires, the plastics, the synthetics. How about the steel? With what kind of energy is the steel mined, transported, forged, transported again, processed, fabricated, transported again, assembled, and transported again? More fossil fuels. It ain’t just the gas in the tank. It’s everything. Our world floats on an evaporating reservoir of petroleum. When it dries up at last, finally, completely, zilch, kaput, sometime in this century, what are our kids and grand kids going to do? This is a question even our most noble leaders can not face. The President (of whatever political party) plays Nero, fiddling with Congress while Rome burns. If our grand kids are going to have safe water to drink, light to read by, and the other swell uses of electricity, we are going to have to learn how to manufacture well pumps and solar panels locally. And for the long haul. Only a few poets and lumbermen, have the guts to look down the line, way, way down the line, five hundred years, a thousand years, ten thousand years, and make plans. Ten thousand years! Can we still be here in ten thousand years? The best long, long range planning I know about here in the foothills is conducted by the timber industry. Sierra Pacific projects it’s timber harvest out hundreds of years into the future. How many of our “leaders” look beyond their next election? Before buying rural property, or any property that relies on a well for the domestic water supply, the well should be tested. You should also test a well any time you notice a change in the taste, color, or clarity of the water. If you depend on a well, you should probably have the quality of the water tested every now and then as part of your general maintenance. Hire a reliable well testing company if you want a complete test. This test takes at least 3 and 1/2 hours and maybe longer depending upon your county requirements. Currently, in Placer and Nevada counties, California, complete tests cost about $450.00. If you are just testing for bacteria or mineral content, you can get a sterile container from the lab, collect the sample per instructions, take it to the lab yourself. If the test is part of a real estate transaction, however, you should be cautious of something called “chain of custody,” because you don’t want any doubt about the source of the water to be tested. Capiche? What are you looking for in a complete well test? First, you are looking for yield (how much water does the well produce? ), expressed in GPM or Gallons Per Minute. The tester will disconnect the well from the pressure tank (also called a hydropneumatic tank) and/or holding tank (also called an atmospheric tank) and cause the water to flow directly from the well and through a pipe where, typically, it just dumps on to the ground. Between the well and the end of the pipe, the water will run through a meter where the flow is determined. Old time testers don’t even use a flow meter. They direct the water into a 5 gallon bucket, then use a stopwatch or timer to determine how long it takes for the bucket to fill. If it takes 1 minute for the 5 gallon bucket to fill, then the yield is . . . uh . . . 5 gallons per minute. The meter will be checked, or the bucket filled and timed, every 15 minutes over the length of the test, usually 3 or 4 hours. Typically, the flow will be greater at the beginning of the test while all the accumulated water standing in the well is drawn out. At some point, the flow will level out and remain at a constant flow for the remainer of the test. That constant flow is the true yield of the well, not the gusher you get at the beginning of the test. Some wells are so strong that the yield at the beginning of the test is the same as the yield at the end of the test 4 hours later. That means that the well is producing more water than the pump (way down at the bottom of the well) can deliver. Wow, that is a good well! a. absent (meaning there is no significant bacterial contamination). Yay! b. total coliform bacteria present in significant amounts. Pooh. Don’t freak out. Total coliform can be treated. Typically the treatment is easy and cheap. You introduce a chlorine product into the well, wait a while, flush it out. Bacteria gone! Sometimes you have to “chlorine shock” the well more than once, and I’ve personally seen a well require 4 “shocks” to come clean. What causes total coliform bacteria to contaminate a well? Who knows? A spider gets past the seal, a new pump is installed without being perfectly sterilized, dirt falls down the hole during maintenance. There are a few wells that require regular “shocks,” but those are not typical. This is bad news. Very bad news. Wells that show e. coli contamination often have to be destroyed and abandoned. E. coli is dangerous, and can be fatal. This pernicious bacteria grows in the intestines of animals (around our neck of the woods, it’s usually cows) and is spread from the animal dung into the ground water where it flows downhill into poorly placed or poorly constructed wells. The problem is that, even if you clean the well with chlorine, the infected ground water has found a way into the well, and it will just keep dripping and oozing into your water. The cure? Drill a new well in a better location. In real estate transaction, e. coli is often a deal breaker. Again, don’t freak out. Well water always contains some minerals. Acceptable safe levels for most of these inorganics have been long established. Your lab results will show how your water compares to these safe levels. Even if your well water is heavily mineralized, most problems can be handled by filtration systems. What will a $50 basic panel reveal? Salinity, acidity, hardness, iron, and manganese. Want to get exotic? You can test for arsenic, alkalinity, copper, lead, saturation index (tendency to form lime scale), nitrate, sodium, mercury, nickle, boron, magnesium, chloride, sulfate, potassium, flouride, aluminum, antimony, barium, beryllium, cadmium, chromium, selenium, silver, zinc, and, of course, thallium. You can even order a la carte and design your own mineral test! This is what the well actually looks like. Disappointing isn’t it? All this hooplah over that little thing. Here, in bullet form, are the main rules for building a “granny” unit (or house, or flat) in Auburn, California, in fact, throughout Placer County, California. You can see that the maximum size for a granny is 1,200 square feet. Period. You can put a granny unit on a parcel smaller than 1 acre, but it must be attached to the primary unit or integrated within a detached accessory building, typically a garage. The granny may be attached to garage as long as the granny has its own separate entrance. You can add an additional 25% to the granny as a covered porch open on at least two sides. The granny must be architecturally compatible with the primary residence. Most grannies require two off-street parking spaces. What is the main obstacle to adding a granny to an existing residence? Poop. That’s right, I said poop, or more specifically, getting rid of poop and other sewage which includes everything that you wash or flush down your drains. If the property is already hooked up to a sewer line, you may find the permit process pretty easy. Just tap into the existing line . . . and, of course, pay the county some more money, up front and on-going. Repair field? This is suitable undeveloped space large enough to install another entire leach field if the original leach field fails. If you add a granny, you are going to have to increase the capacity of the existing septic system, or (hold your breath) install an additional new septic system with it’s own tank, leach field and repair field. This will require new percolation and mantle tests, a new septic system design, and installation. Thousands of dollars. How many thousands? If you are very lucky, $10,000 to $12,000, but you better be ready to pay more. If you are buying a home with the intent of adding a cozy little nest for granny, the very first thing you need to learn is whether you will be allowed to obtain a septic/sewer permit for the second dwelling . . . and how much that is going to cost you. Learn this most vital fact before you close the transaction. Irrigation water in the Sierra Foothills is not immune to the politics of California Water Wars. Water is a precious commodity and transporting water is expensive, especially to the thirsty throats of the southern California cities and central valley agribusiness. Professional well drillers in Nevada County, California charge $18 to $21 per foot to drill with a minimum drill of 100 feet. 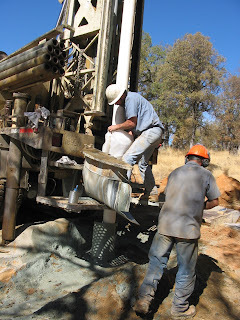 The drilling fee includes 20 feet of casing into bedrock and a seal and cap. Conventional home evaluations for the rural areas between Auburn, CA and Grass Valley, CA will yield that most-important statistic–price per square foot. This datum will be the foundation for the price estimated by appraisers. But, in our rural areas where properties vary enormously in acreage and other critical elements, we must also consider extra values that can add to–or subtract from–the mostly likely sales price.